AZZ Lighting Systems is a leading provider of long-lasting, high-performance products to a vast array of demanding industries, such as offshore and onshore facilities, while supplying the drilling market with heavy-duty Rig-A-Lite products. Each drilling and production application presents its own unique set of challenges, such as vibration, corrosive areas, wet locations or space constraints. AZZ has developed its reputation by supplying rugged and dependable illumination to the oil and gas drilling and production market. The LHFL LED floodlight features a low copper content, corrosion-resistant housing with a baked-on polyester finish. It has a high-impact glass lens, a 360° rotational yolk arm mounting, 7 x 5 beam pattern and uses Cree Xlamp XM-L LEDs and the driver also offers 0V – 10V dimming as a standard feature. The standard correlated colour temperature (CCT) is 5,000K with 3,500K and 4,000L options available. The LHFL is suitable for hazardous, marine and wet environments, including areas with exposure to salt water and temperatures from -20°C to 55°C. It is also designed for locations where hazardous gases (Class 1, Division 2), dusts (Class 2, Division 1) and fibres (Class 3) are contained. Alternatives for 175W, 250W and 400W metal-halide lamps are available from AZZ, which offer energy savings of up to 50% and zero maintenance for up to 60,000h. Rig-A-Lite’s MAR2 series fixture has been a key product in the offshore and land-based drilling rig market for decades. It is UL-listed for hazardous environments where liquid and gas protection is required. The extruded aluminium body is thicker and highly corrosion-resistant, so it can withstand the salt water environment of an offshore drilling rig. The spring-loaded lamp sockets assist in minimising vibrations and the heavy-duty lens frame and lens help keep the water from entering the housing. An end cap enables 360° fixture mounting and features an improved watershed housing design. The MAR2 fixture can be applied in wastewater treatment facilities, mining, military bases, refineries, chemical plants and other hazardous locations as it is certified for wet locations and heavy hose-down areas. AZZ supplies the MAR2 with T12 and T8 lamps and it can be customised to suit the clients’ specifications. It is also available in a selection of AC and DC voltage configurations with an optional emergency battery backup. Rig-A-Lite’s XP LED series is a range of specialised explosion-proof lighting for chemical plants, onshore and offshore drilling rigs, refineries, paint booths and wastewater treatment facilities. The versatile XP LED range offers protection from hazards such as corrosive elements, extreme temperatures, explosive gases and compounds. These versatile lighting fixtures are also approved for use in areas that come into contact with salt water spray and corrosive chemicals. The XP LED lasts three times longer than traditional fluorescent light sources and provides significant energy savings. AZZ supplies this model in lengths of 2ft and 4ft with various lumen packages, it is also the only Class 1, Division 1 LED product on the market with available dimming (0V – 10V), an emergency battery backup and an outboard option. 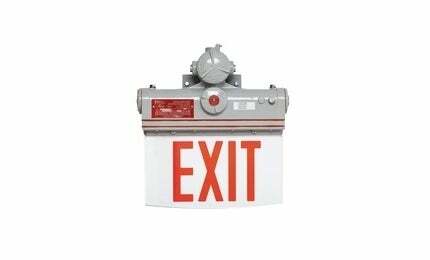 Rig-A-Lite’s XPEX is a patented product, which is designed as the only LED exit sign / light available approved for environments requiring explosion protection. Its LED light source makes it the most energy-efficient option for emergency and exit lighting. The maintenance-free, salt water-resistant XPEX is also approved for outdoor marine use. The XPEX is also the only exit sign / light with a built-in battery, which eliminates the need for a designated circuit and any related labour and material costs. Its battery offers three hours of illumination, exceeding the NEC specifications and unlike self-luminous exits, the sign can be seen through smoke.